Think Tom Cruise in the movie Cocktail crossed with Bob Marley and you’ve got one very chilled out showman. Move the setting to Siem Reap and meet Mao Hong Kry. It should be no surprise that Hong is behind the bar tossing bottles and cocktail shakers around with his staff when we arrive. It is clear he is an entertainer – a crowd-pleaser and a lover of attention. It is also clear he has taken some significant influence from Bob Marley and the reggae crowd. But the 31-year-old is also a businessman and he is trying to make a go of it in a competitive industry and in a town where there are limited options for poor kids with little or no education. 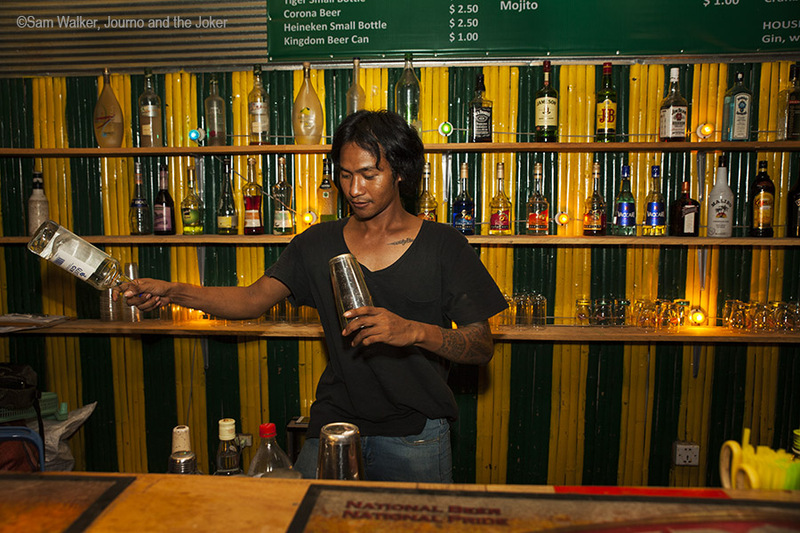 The setting is Peace and Love bar, a dimly lit reggae-style bar situated on Night Market Street, across the road from Siem Reap’s original night market. The décor features an innovative use of recycled materials. Bamboo lines the walls, old 20 litre drums with coloured lights in them, hang from the high ceiling and provide most of the venue’s lighting and the walls are painted in distinctive green and yellow. From the outside, it looks a little seedy. But step inside and you’ll find a welcoming atmosphere, where the staff laugh and joke and Hong will happily sit with you and have a chat in between serving customers. Peace and Love is Hong’s fourth business. He also runs the Soul Train bar, in a lane running off of Pub Street. It is similarly themed but he says it is “more chilled” than Peace and Love. He started his first business at the age of 27 – a tuk tuk bar that he operated on the street. “The first idea that made me have success was the tuk tuk bar,” he says. He sold hot dogs, cocktails, fruit shakes and Vietnamese coffee from it. The coffee, he says, was cheap, but it also had flair and looked good and his showmanship came to the fore. It is an impressive resume for a young man who grew up in a poor rural area near the border of Thailand. “I live with chicken, duck, like that, live with animals,” he says. He went to school until grade six and then had to leave. When he was in his mid teens he went to a pagoda to continue his education. “My parents are very poor and they sent me to the pagoda to study with the monks,” he says. It is where he learnt to speak English and says he carries a dictionary so he can keep improving and learning. 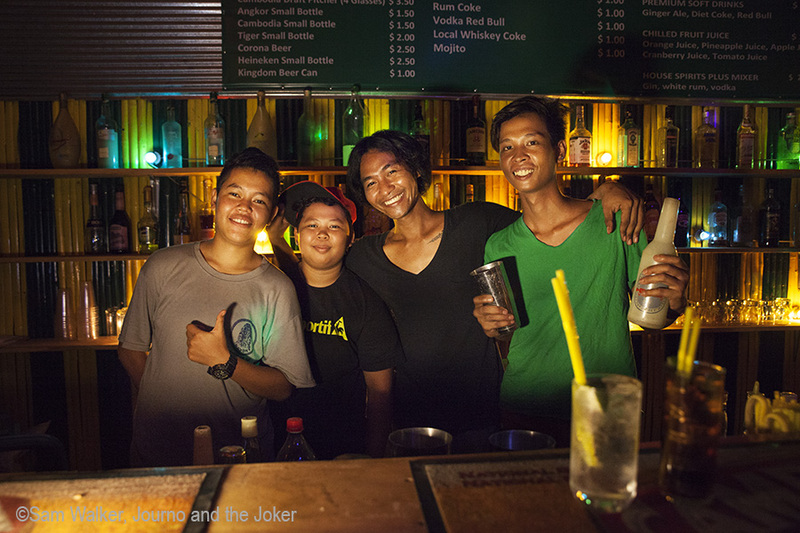 When Hong first moved to Siem Reap he found it very hard to get a job. He started with a security position and moved on to be a kitchen hand but soon realised nobody knew him in the kitchen. Even then, he craved the attention and wanted to be around people. Then he met a Thai man, who showed him clips of Tom Cruise in Cocktail on You Tube and Hong was hooked. Hong has a warm, friendly face with a big smile and he loves interacting with people. But he’s a businessman who realises the value of his staff and the importance of training them. He says a lot of business owners are very aggressive. “Me, I want to have 10 Hong’s. So I train them, I give them everything. And while he is the boss he knows he was in their shoes once and is happy to help guide them towards their own success. “I never forget my root,” he says. We chat while his staff practice juggling dummy bottles of liquor and cocktail shakers. He takes the time to stop and show them something and they continue with their antics. It seems important to him that Peace and Love is a place where tourists can also feel like they are with a family when they are away from home. 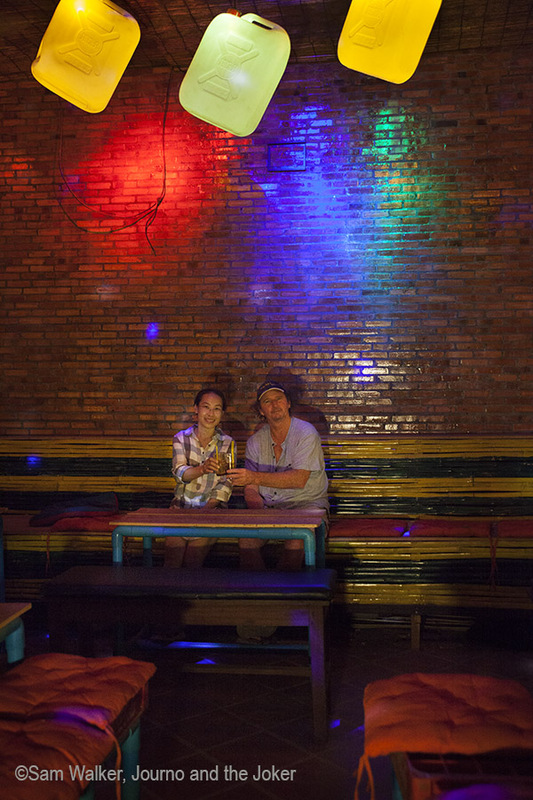 And he wants the bar to be a meeting place for Khmer locals and tourists. He is not married. His mistress is his business until he becomes more successful. It is too distracting to have a business and a wife and children and he doesn’t think he can devote the time needed to both. Hong still has big plans. He travels widely – online. The power of Google has enabled him to research from his phone what is happening in other places. He “travels” virtually to Thailand a lot, looking at the most popular bars and he has plenty of ideas he wants to implement. But he also realises he still has plenty to learn. “Learn or study, in my opinion is never finished. 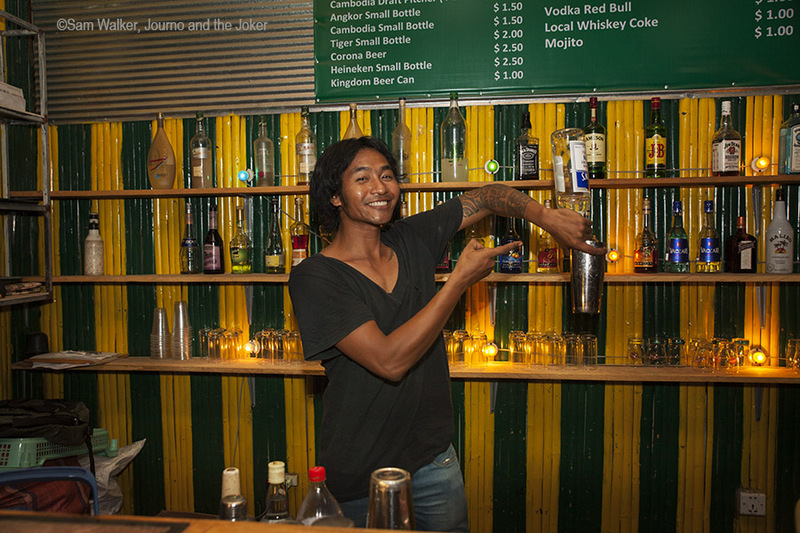 Peace and Love bar opened about four months ago and Hong admits it has been very quiet. But he is hopeful it will take off when people start to know it. “Life is like riding a bicycle. To keep your balance you must keep going,” he recites a popular quote that motivates him on his journey. He has vision and ideas and he’s a born entertainer. It could be a heady combination for the young entrepreneur. What fantastic story, and what an amazing experience it must be to meet all these wonderful people! Thanks Alyssa. Yes, I always love hearing people’s stories, wherever I am but travel opens your eyes to a broader array of people I think. Sounds like he is a real entrepreneur. Love that he wants to inspire others to dream big as well. Hi Danii. Yes, he is quite an entrepreneur. So many people here lack that drive and initiative for various reasons but I think a lot of the younger generation are really trying to move forward. And many of them want to help others do the same. I love this! I traveled to Siem Reap a few years ago and absolutely loved it. I wish I would have stopped in one of Mao Hong Kry’s places. The Night Market was so amazing that was a highlight of my trip walking around there. Thanks for stopping by and reading. I don’t know if Hong had these venues a few years ago. Peace and Love only opened this year. But I imagine his tuk tuk bar was going then. Glad you enjoyed Siem Reap, it’s a great place. The best part of traveling is getting to know the community. Thank-you for this snapshot; Hong’s story is inspiring and he really seems like a character. I couldn’t agree more and we are so lucky that living here means we are really able to get an insight into the people and the culture. Hong is a great character and is so determined to get ahead and help others along the way.